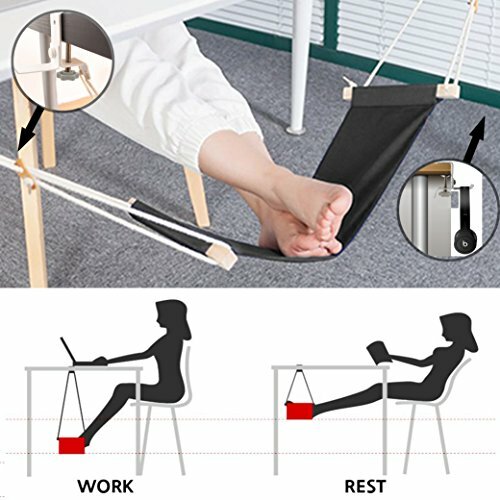 Strong and features foot hammock,easy to hang and assemble, a healthy and comfortable way to improve your sedentary life,relax your feet and relieve your fatigue. If you have any question, please feel free to contact us any time, we'll do our best to resolve your question,THX. 【UPGRADED DESIGN】Unlike other ordinary foot rest under desk , we have equipped bolts nuts kits with two clamps that can be adjusted to your most comfortable position and fixed there so you can work or rest at your dest without worrying about your foot hammock sliding or falling down. 【NEW FEATURE】Our desk foot rest add a new hook on one side,it can act as a headphones holder、handbag/backpack holder or some other things you want to hang. 【PORTABLE &ADJUSTABLE】The foot rest storage is easy to be fold away and put anywhere for relaxing.Free to adjust the height and mode for work or rest cause the length of the rope is from 400mm to 600mm. Extend yourself mostly to be relaxed. 【EXCELLENT MATERIAL】Made of high quality cotton canvas,soft to touch not easy broken. Adopting breathable material brings feet cool feeling. Lightweight and eco-friendly ,a good choice for office or home relaxing. 【HEALTHY & COMFORTABLE】The office foot rest can relieve pressure on your back if you spend a long time sitting at the desk.Relax your body to promote blood circulation and improve your health and life. If you have any questions about this product by HYNEWHOME, contact us by completing and submitting the form below. If you are looking for a specif part number, please include it with your message.